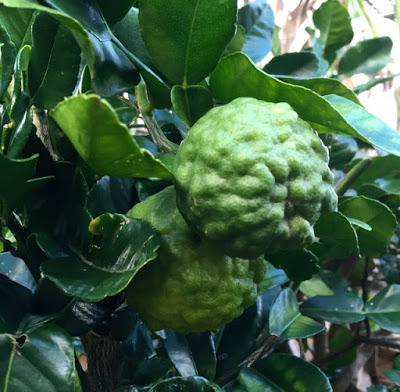 This follows on from the previous post about turmeric and about eating your way to good health – and, while we are at it we might as well have something seasonal and delicious! 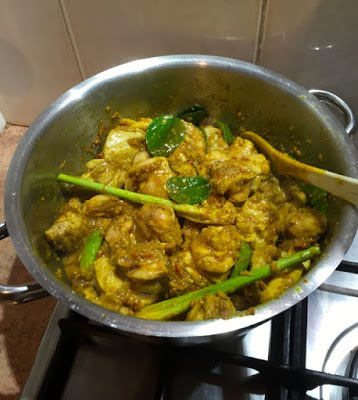 And, the absolutely best thing about making a curry like this is the heavenly fragrance that wafts throughout the house when it’s being prepared. 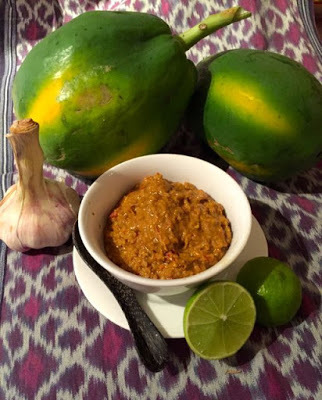 So this is a curry paste that you can make from either fresh or dried ingredients and keep it refrigerated to make up a quick curry of either chicken, tofu or vegetables. 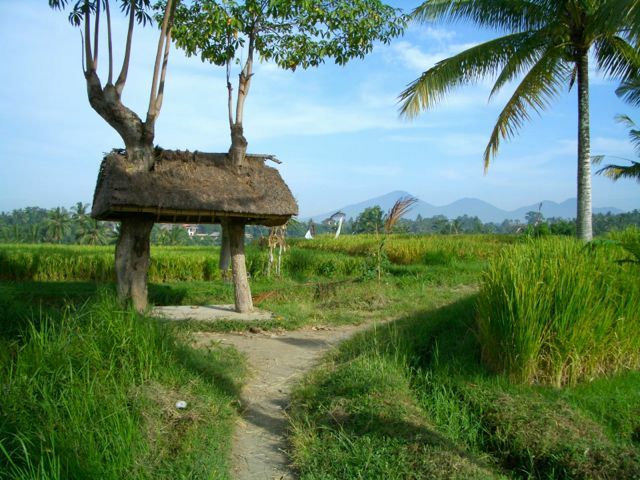 I have spent many happy and fascinating times in Indonesia and am a big fan of it’s little known cuisine (how many Indonesian restaurants do you have in your town?) – this is one such dish. If you like Indian curries, you will be surprised at the freshness and pungency of this dish by comparison – give yourself, and your taste buds a treat and try it. 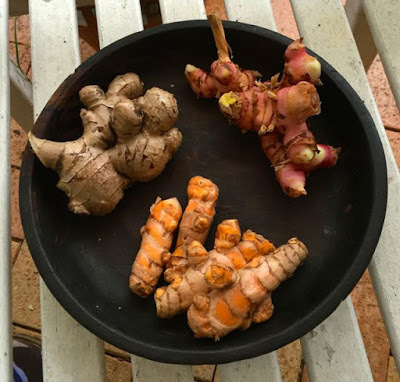 This photo shows three members of the ginger family which I have just harvested and use fresh in this recipe – common ginger, galangal and turmeric. 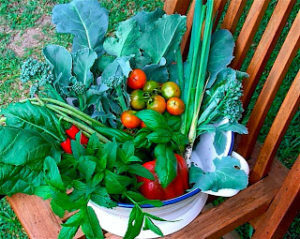 Fresh ingredients, if you can get them, are always going to give a superior flavour to dried. Extra small, birds eye chillies if you like it really hot. 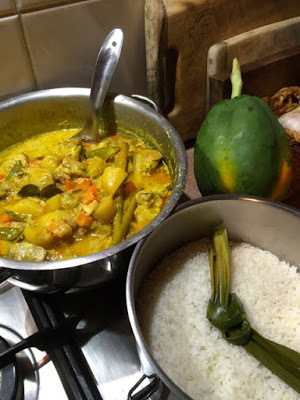 NOTE: A traditional Balinese recipe would also call for lesser galangal kaempfera galanga, but I have never been able to buy it in Australia except in a stale old powdered form, so I leave it out. Meanwhile, I’m hunting for a plant to grow in the garden. 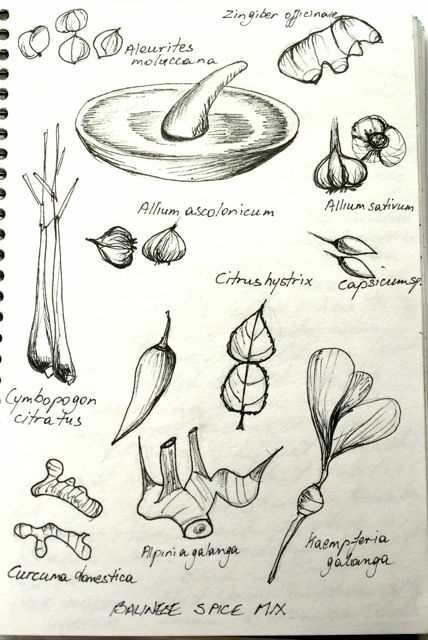 An old travel diary from Bali and my attempts to work out the botanical names of the the spice mix after a cooking class in Ubud. 1. Apart from the oil, process all of the ingredients in a food processor until a thick paste is formed – you may want to add a little of the oil to combine it. 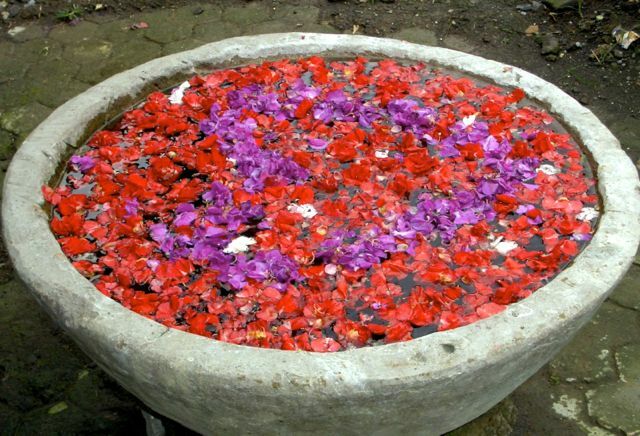 Traditionally, in Bali, they would use a mortar and pestle to do this, but I don’t have staff!! TOP TIP: After you have combined all the ingredients, leave them in the food processor for about 20 minutes to soften and then re-process – you will get a finer paste this way. 2. Heat the remaining oil in a wok and fry the spices over a medium flame, stirring constantly, for 2-3 minutes until the mix is glossy and golden. NOTE: When this has cooled it can be stored in clean jars in the fridge with a little oil on top until ready for use. 2. Heat the oil in a wok and throw in the chicken pieces and stir around for a couple of minutes. 3. Add 2 tbsp of the curry paste and stir around to coat the chicken. Throw in the lime leaves and bruised stalks of lemon grass. 4. Add the water and cook uncovered until the chicken is tender and the water is reduced by half. 6. Add the coconut cream and briefly bring to the boil just before serving. Serve with rice.